Today I’m Haul-ing Out The Holly with Gwenny Penny! Have you heard of this special event? Well, let me tell you. From November 28th to December 16th, 2011, Gwen is busy “featuring fifteen original holiday-themed tutorials from fifteen talented craft bloggers”. Wow. That ought to keep you hopping for the “holly”days, eh? So if you’ve come over from Gwenny Penny, welcome to Michele Made Me! As you may or may not know, I have two older girls…well… women would be a more accurate descriptor probably… they are 19 and 24 years of age after all… Each year by request, we give them the gift of moollah. And each year we do the same old thing: we put the money in cards and place the cards in the tree blah blah blah. This year I wanted to do something a little more memorable, a little more special, you know? 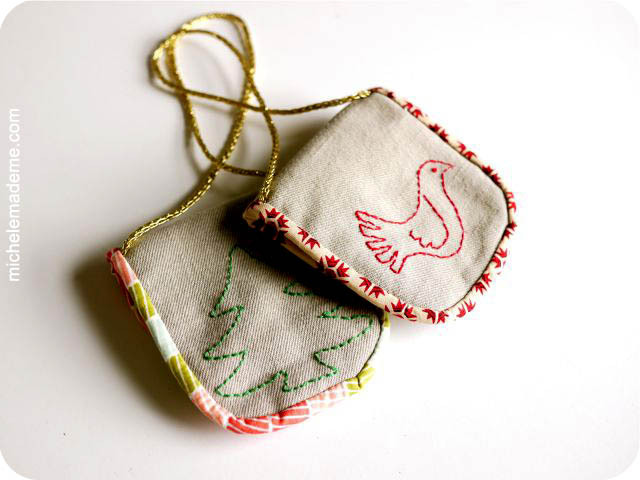 Hence, the petite purse ornament. Each monogrammed purse is just big enough to stuff with a bundle of crisp bills. I am actually excited to hang these pretties in our tree for the girls. I also plan on using them every year from here on out too. So I made them to last. Won’t that be a sweet new tradition? Step 1. Start by tracing out two paper templates. The larger template measures 3 inches (8 cm) x 5-1/2 inches (14 cm) and the smaller measures 3 inches (8 cm) x 4-1/2 inches (11.5 cm). Use a small drinking glass to round out the corners of both templates. Cut the templates out. Step 2. Cut out your fabric. For my solid fabric, I used a pair of old cotton pants. Cut 2 of the large template from the solid fabric. 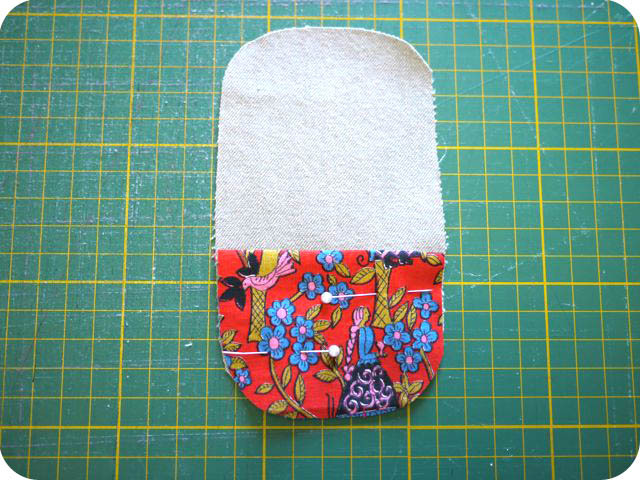 Cut 1 of the small template from a colourful printed scrap; it will serve as the pocket. Finally cut a ~ 30 inch (75 cm) x 1-1/2 inch (4 cm) length of another pretty print for the binding. Step 3. Take the small colourful piece you cut out and fold it in half, wrong sides together. Press it. Pin it in place onto the good side of one of the larger solid pieces. Match the bottom edges as below. Machine-sew that piece in place along the perimeter only using a 1/8 inch (3 mm) seam allowance. Step 4. 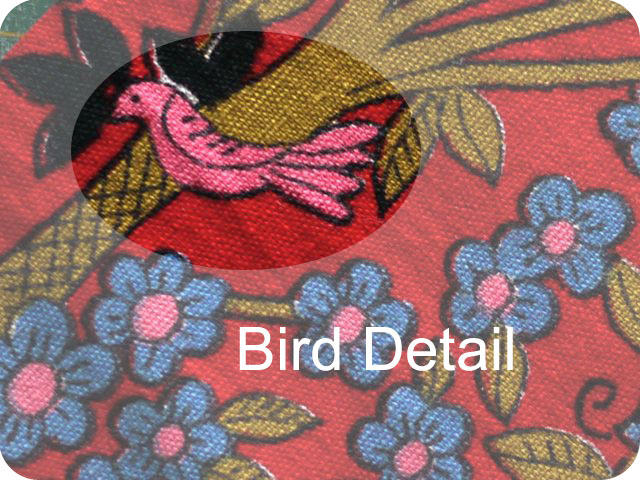 Next, if your fabric has some pretty detailing (mine had a bird on it) you might want to draw something similar for your embroidery detail. That’s what I did. I drew a close likeness of the bird on a piece of paper and then transferred it near the bottom of the other solid piece using transfer paper. Make sure it is centered and not too close to the edges. Then I embroidered the bird using a simple backstitch. After turning the piece around, I then transferred the initial “N” (in American Typewriter Font) onto the opposite end of the same piece. I backstitched the “N” as well. Notice the “N” is upside-down in the following photo. That is as it should be. Here’s a closeup of that bird on my colourful print fabric. Step 5. Now pin the two solid pieces wrong-sides together. Mark a line 1 inch (2.5 cm) up from the pocket. Stitch along that line. 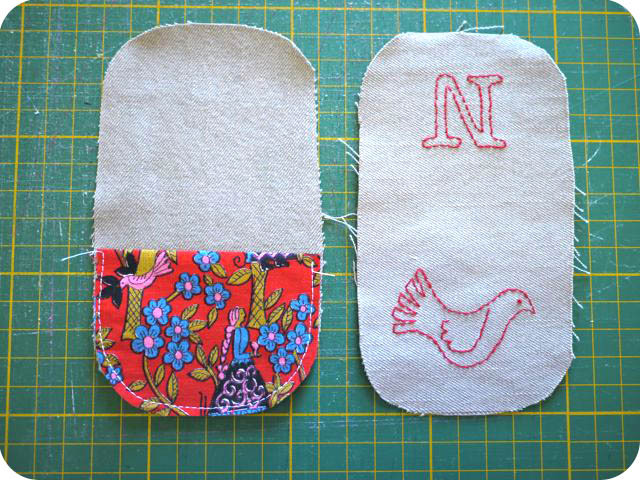 Sew a second line of stitching 1/8 inch (3 mm) up from the first line. Step 6. Next it’s time to attach the loop closure. I used a 4 inch (10 cm) length of gold cord to serve as my loop, but you could also use a piece of ribbon or make a matching fabric loop. I folded the gold cord in half to create my loop. 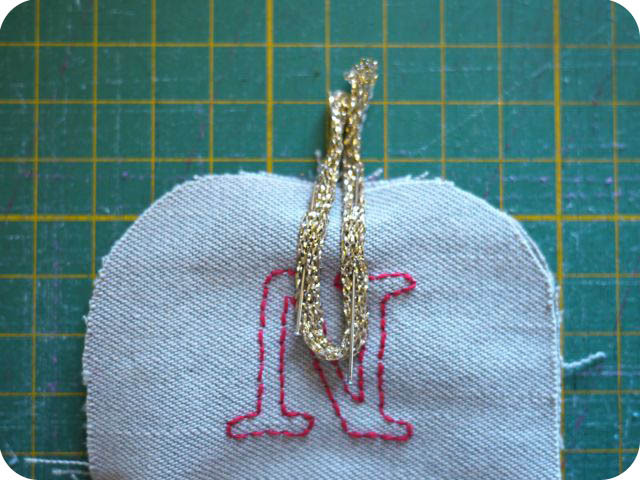 Pin the loop along the top edge of your main piece, just above the monogram. The loop should be facing in, as shown, and lying about 1 inch (2.5 cm) into your fabric. Machine-stitch the loop onto the piece with a 1/8 inch (3 mm) seam allowance. Step 7. Now for the binding. Fold your binding in half lengthwise and press. 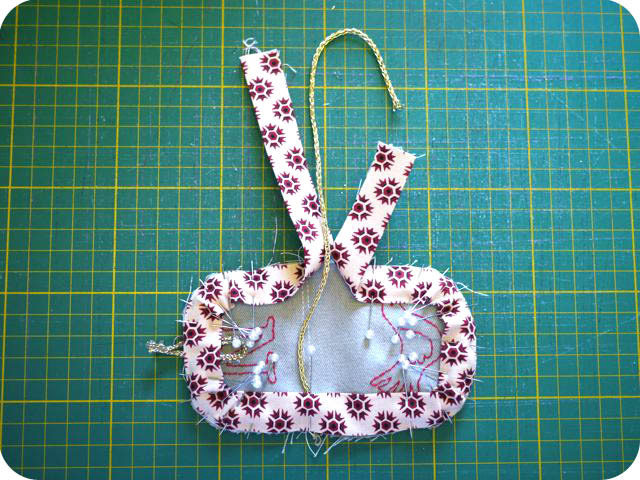 Starting in the middle of a long edge of the main piece, and leaving a few inches of slack, pin the binding in place. Be sure the binding hugs the edges as closely as possible. You’ll notice the binding will bunch a bit in the corners. That’s okay, as long as the binding is flat near the edges. Don’t forget the hanger. 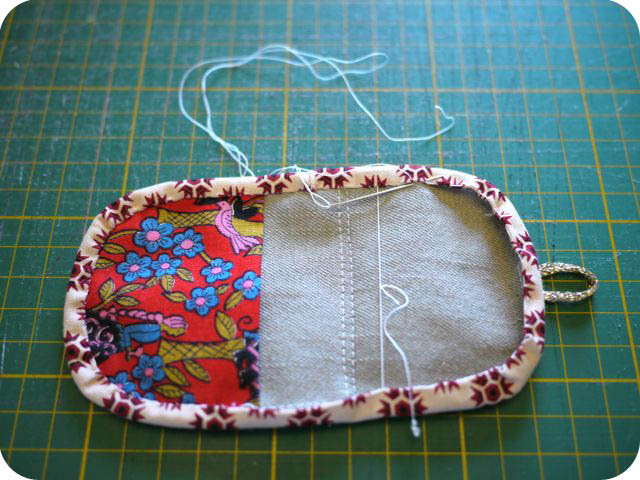 Pin it in place under the binding and perpendicular to the bottom edge near the two lines of stitching as shown below. Step 8. Slowly, machine-stitch a 1/4 inch (6 mm) seam most of the way around except for the two inches (5 cm) in the center where the ends of the binding will meet. Machine-stitch the binding ends together, ensuring that there will be no slack in the binding once this is done. Trim the excess binding. Once again, don’t forget the hanger. Pin it in place under the binding and perpendicular to the top center edge near those two lines of stitching. Finish sewing the seam. Step 9. Trim the edges of the piece all the way around. I removed about 1/8 inch (3 mm) of fabric from the edges. Step 10. Turn the ornament over. Flip the binding to this side as well. With needle and thread, baste a running stitch all the way around the very edge of the binding. Pull the ends of the thread to tighten the binding snuggly around the edges. Step 11. Carefully handstitch the binding in place. Step 12. 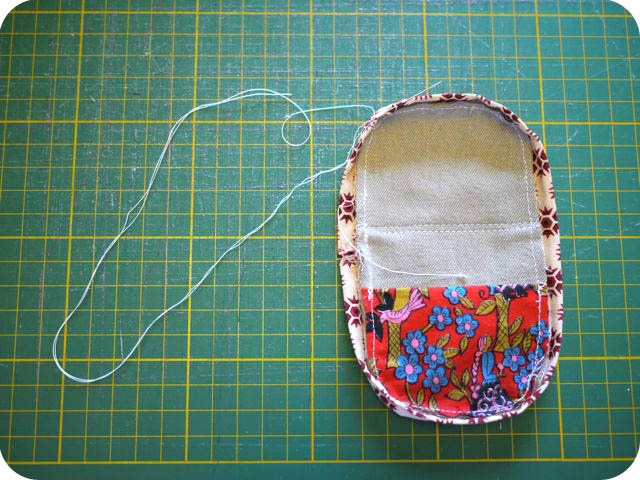 Attach a lovely button to the bottom center of the colourful pocket, hiding your knots within the pocket. Now, as a bonus, if you recall Monday’s post, I’d shown you some grooming kits I’d made as gifts? Eh? 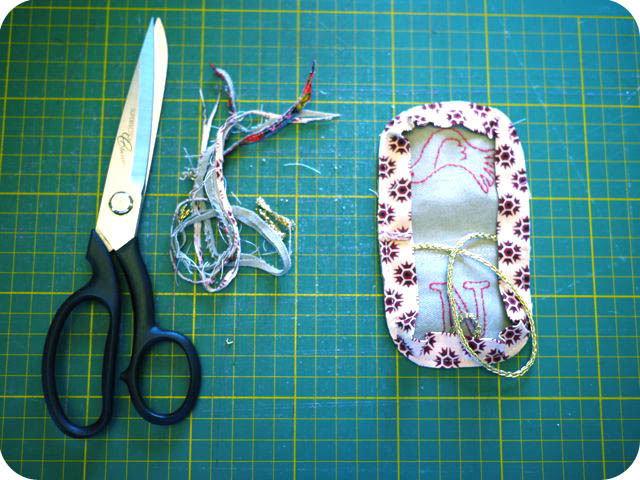 Well, if you omit the hangers from these little purses and scale up the templates a little, you can create Monday’s grooming kits from this same pattern. Handy, oui? Okay. That is that, I think. Let me just thank Gwen for inviting me to share in her joyous event. Big hugs to you Gwen! And let me remind you to visit Gwenny Penny to have a gander at all the Haul Out The Holly goodness from this season and last. These are wonderful! Just imagining all the fun treats that could be tucked inside for everyone to hunt around the tree to discover their initial! Thanks for sharing! Thank you for sharing this excellent tutorial and doing it so soon, there is enough time till Xmas to make it! Very precise work and special as a gift! Such a fun idea. You could also use this for younger children and hide a treat in it each day until the BIG day arrives. Thanks for the tutorial. Those are really sweet Michelle and much nicer than an envelope…. I love these Michele!! They are so adorable!!! 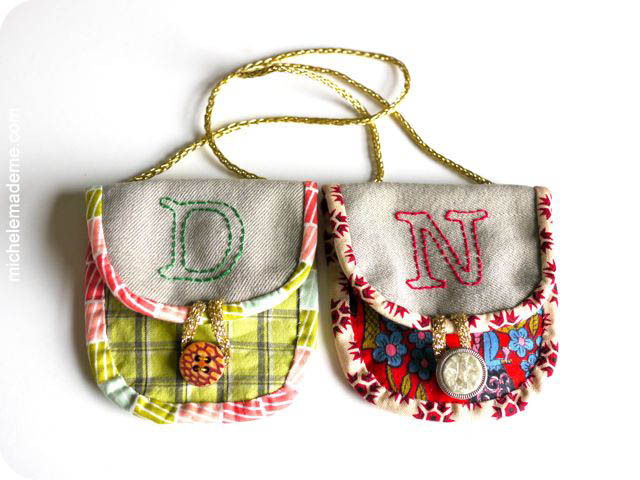 What gorgeous little purses!! Great way to give a gift of money. I love the monogram letters and little birdie and tree you stitched on too! Just adorable! Oh, wow, not only is the ornament (and concept) lovely, but so is this gorgeous, detailed tutorial! Thanks, and I once again bow to thee, blogger of renown. 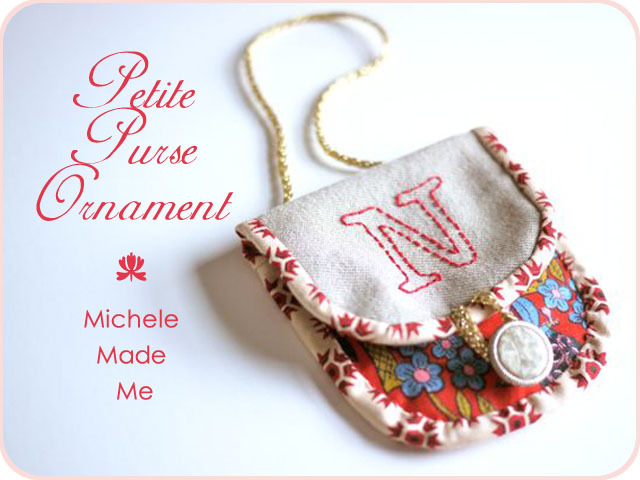 Michele, these mini purses are super adorable and I am sure your daughters will love them. I really love monograms on a tree. These are super adorable and I'm sure the 'women' will love them! I just discovered your blog today through a link from Checkout Girl and I'm smitten! I made one of these last night and posted it on my blog. Have a look! Ooooo you have been so busy! I don't know what I love more your little purses, or the snowflakes – I want them all!!!!!! This is absolutely WOW! the tutorial..the photos…the purse…now I'm nuts about purse! Can wait to make one! I love this project. I hope that you don't mind that I link you in my blog.